The Radionic Ships of the Heavenly Host | Mother, Father and Scout Ships Together. To recap, Anchor Radionic Ships set Radionic magnetic Fields. Mother Ships, Father Ships, and Mobile Scout Ships maneuver about within the fields. The idea that a Mother or Father Ship may or may not be in the same image as an Anchor Scout Ship is actually kind of humorous. Nearly all of the Anchor Scout Ship photos for this disclosure has a Mother Ship or Father Ship or both tucked in somewhere near by. You just need to know what they look like in there. Remembering also, that Mother Ship Radials are like tubes and tendrils while Father Ship radials are frills or fringes. Anchor Ship Radials are usually wide and feathery. Some of the Anchor Ship Radionic magnetic fields can be enormous depending on how high up they are. As said, spanning hundreds of miles in some cases. Sometimes a Mother or Father Ship will be right up tight like peaking out from behind a curtain. Sometimes they will be like an Albatross on the wing, fluttering around in parts unknown. The fun part is in seeing what you get when you take a closer look at the Anchor Ship fields in Starrgrams 1 and 2, And now that you are aware, seeing just how obvious some of them actually are. The very first, Figure 3 from Starrgram 3 is a good place to start. 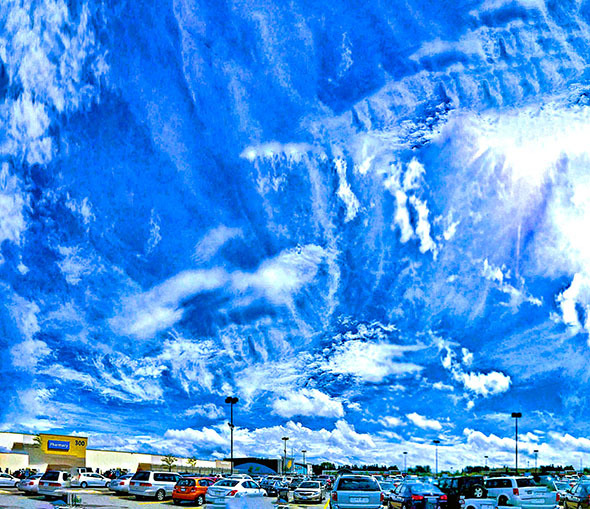 See the unmistakable tendrils of a Mother Ship coming in from the right. Unfortunately the photo had been taken right at the beginning before this Disclosure project had become a project, and the idea of looking on the other side of the house to see what was over there never even came up. Figure 1 - Seeing not, so not seeing. The Figure below is an even better one. The Father Ship is sitting right behind the prongs of the Positive pole Field of Figure 5 of Starrgram 3. The Figure also shows that these things are not always that far away. Figure 2 - Nothing like splitting the difference. Similarly, the following Figure below is a very good photograph of a Saucer Shaped Father Ship Condensate sitting inside a Positive Polarity Anchor Ship field. Also shown as Figure 2b in Starrgram 4. Its Mother Ship partner is sitting less clear in the center just above the trees. The Positive pole Anchor Ship Field aspect is not that obvious. But as shown as Figure 2a in Starrgram 4 it is the patent partner of a very obvious Negative pole field photographed from the same location. Figure 3 - At least I have a blue V underneath. The Figure above actually also has a less visible Saucer Shaped Mother Ship Condensate partner sitting right beside it just above the trees in the middle. The Figure below, photographed in Brantford on The 25th of September, 2016, has exactly the same type of Mother Ship Condensates sitting in the middle of a Father Ship Field. The arrow pointing right to it doesn't hurt. Similarly, the following Figure shows a Father Ship condensation in a Negative pole Radionic field previously shown as Figure 16 in Starrgram 2. The Father Ship condensation is at the far center-left and the Anchor Ship field is smack dab in the middle. As mentioned, these types of Father Ship condensations are fairly common. Also see one in Figure 23 of Starrgram 7, and also at the center-right in Figure 10 of Starrgram 1. Figure 5 - What are you all looking at, I always sit out here. This is my happy place. 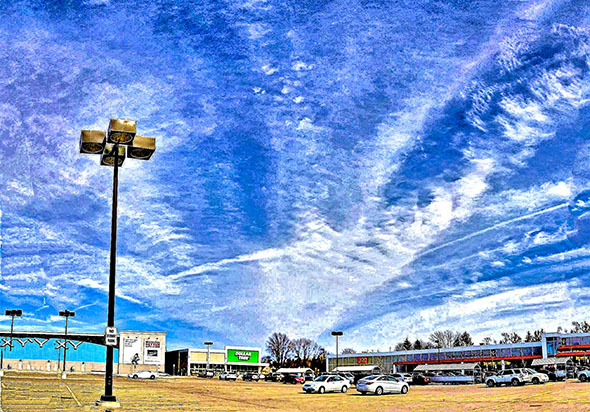 Back in Brantford on the memorable day when Anchor Ship Radionic fields were visible undiminished all day long, the panoramic Fields of Figure 6 in Starrgram 4 shows the unmistakable tendrils of a Mother Ship field sitting in plain sight right in the middle between the two apexes. In this case right behind the tree. In a similar vein and for a really big rarity, Figure 18a and 18b in Starrgram 4 held a big surprise. Completely unsuspected in the original views and completely unbeknownst to the photographer until the haze had been removed, enhancements done, and they had been joined end to end by a full sweep down one side, a nice big Father Ship was sitting right right in the middle bleached out by the Sun. Figure 18b in Starrgram 4 shows the Father Ship frills at the left side even better. As seen in the right side of Figure 19 in Starrgram 4, and as also shown below in a half sweep version taken at the original view location, the Father Ship is running almost pole to pole. Like Figures 9a and 9b in Starrgram 7, this is quit a bit of a rarity. With some of the large very high up and well spaced apart Anchor Ship canopies, this would have meant that the Ship was hundreds of miles long. In the case of Figure 10 in Starrgram 7, it was ten miles long, because even though it was horizon to horizon the Jet Stream was close in overhead. In the case below, the Father Ship Field was not very long as the whole canopy itself was sitting in pretty close overhead. So the Ship was kind of short but talk about a square fit. Also, notice that in the left side sweep of Figure 19 in Starrgram 4, are two uncharacteristically small Mother Ship Fields, one on the right putting out very short Radial lines, and one in the middle putting out only two very long ones. Figure 7 - The three of us like to hold hands and dance whenever we get the chance. The Figure below, previously shown as Figure 9 in Starrgram 4 has just about everything you want coming and going in all directions. First, a Negative Pole Anchor Ship Field sits at the left. Dry air has evaporated the bottom. A center filled Positive Pole Anchor Ship Field like Figure 33 in Starrgram 3 rather than a Flying V version sits at the right. A Mother Ship Field sits in a wide white arc running from the left top of the building to the right side. A Father Ship Field sits below that just above the building and to the right. The intensity of the Mother and Father Ship magnetic Fields in close proximity, and the close proximity of the two Anchor Ship Fields, has produced an extensive scalaring like affect in the two Anchor Ship Fields which is only seen in part in any other photograph in this Revelationnum. Mother and Father Ships will sometimes sit side by side together within the same Radionic field. For example, a Mother and Father Ship pair vaguely seen sitting side by side like in Figure 26 in Starrgram 7 slants up the left at the lower left hand side below in the Negative Anchor Ship Field of Figure 19 of Starrgram 2. Another Mother Ship Filed sits up the middle. Like said, check back in the Radionic Anchor Ship fields of Starrgram 2 and 3. Stuff's all over the place just waiting to be discovered. Seven odd hours later, as the Figure below, which is previously shown as Figure 20 in Starrgram 2 shows, the Mother/Father Field at the left has strengthened considerably. Also now present is a big white Mother Ship Field slanting upwards to the right from the lower center and a frizzy Father Ship Field up the upper right hand side. No wonder the Negative Pole Anchor Ship Field looks so busy with all that help. Figure 10 - Like said, have a look around. Similarly, from the Brantford photograph Figure 44 in Starrgram 2, a large Mother and Father Ship combination like the Figure above can be seen sitting plain as day right up the center of the Negative Pole Anchor Ship Field. This time the Father Ship side is the dominant aspect. Figure 11 - We take turns, helps keep peace in the family. Mother and Father Ship Fields can also be seen within the same picture, but not lying parallel together as shown below from Figure 1 in Starrgram 2. Figure 11 in Starrgram 7 was a prime example of a Mother Ship and Father Ship sitting side by side with Radionic fields mish-mashing. A closer look reveals there is also a Positive polarity Anchor Ship Radionic field sitting right in the middle mish-mashing with everybody. This is about as busy as it gets. Ottawa had a lot of these kinds of ultra busy fields throughout the nineties and two thousands, unfortunately never photographed. Figure 13 - This Tardis is looking more interesting all the time. At first look, the Figure below looks like a lyre type Positive pole Radionic field such as those discussed in Starrgram 3. A closer look shows however, that it is actually a Negative pole Radionic Cloud which has been split up the middle by a Mother Ship Field like Figure 4 in Starrgram 5. A Father Ship field slants upwards in the blue area at the lower right. The Figure was photographed on June 30, 2016, looking South East. It was a really gusty day. The view quickly became apparent during a brief ten minute observation period as the water vapors quickly moved through. After the ten minutes the sky became completely bland again. There are a lot of additional interesting things going on. Look around, notice the portal activity at the center left. Between the three Fields and the portal there was a lot of magnetic interaction going on. Portals as earlier mentioned, will be discussed in detail in Volume II. 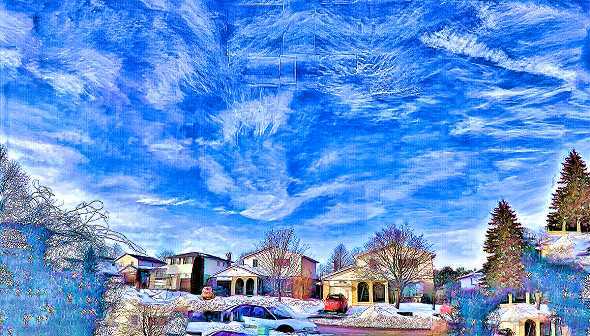 Likewise, in the following Brantford image from Figure 31 in Starrgram 3 a Father Ship can be seen sitting up the center left in a Positive Polarity field. A Mother Ship Field can also be seen sitting straight up just right of center. On the other hand the very neat one of a kind photograph taken in Brantford on July 12, 2018, features a Father Ship Field like Figures 30 to 34 of Starrgram 6 sitting next to the Positive Pole Anchor Ship Field it is hanging around in. The view is to the North West. As shown below, this was another 'Now you see it now you don't' situation. The view started from nothing, expanded up to the full view you see below, then was gone again all in about half an hour. The event was interesting for another reason too. As Figures 9a to 12 in Starrgram 7 showed, A Mother and Father Ship pair had suddenly showed up in Brantford on June 21, 2018. The ships had been there ever since. One or another partially seen views were seen from time to time indicating there presence, but nothing good enough to photograph. The Figure below is proof positive they are still there loud and clear twenty one days later. Another interesting aspect to give you an idea of how ephemric these things can work, the Anchor Ship Field came in first with no sign of the Father Ship. The Anchor Ship Field developed to loud and clear just as the first whisps of the Father Ship started to appear. At its peak it was a thick flying V. Then the more the Father Ship Field intensified, the more the Anchor Ship Field started to fade. The photo below was taken when both were an even match. Shortly after, the Anchor ship Field was completely gone, leaving just the Father Ship Field. Shortly after that the Father Ship Field was gone too. Figure 16 - It's called musical pairs. Though hard to see in the following image from Figure 46 in Starrgram 6, a large Negative Pole Radionic field sits in the background. The large up and down Radial lines at the upper left are the giveaways as are the lines in the blue area between the clouds at the center right and same type lines at the far center left. The assorted Father fields covers a lot of the lower and upper right parts and ordinary clouds at the bottom most of the rest. On the other hand, the Father Ship in the following two prong Positive pole Anchor Ship field from Figure 6 of Starrgram 3 is much more plain and simple. The Ship is running upwards to the right. A Mother Ship sits only partly formed at the bottom of the right hand tine. In an even more definitive case it is hard to mistake this one found on the Internet, because a Negative Anchor Scout Ship flume sits bold and beautiful up the right and Mother Ship tendrils really pushes the field around bold and beautiful across the left. 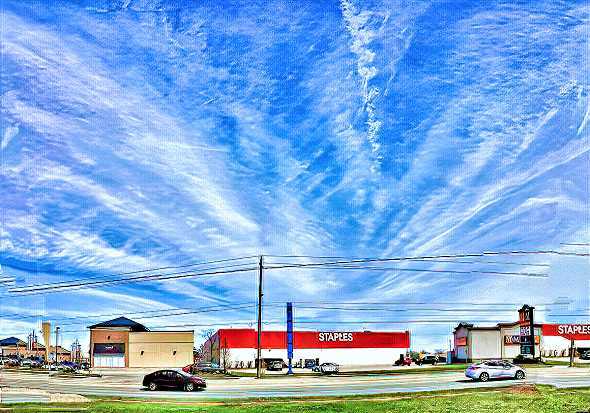 The lines looking like Contrails to the lower right are ionnization radials off the Mother Ship tendrils. Follow them by eye to their source. Mobile Scout Ships are discussed at length in Volume II. In case you don't think these amount to much, look at how effectively one of them screens the Radial emanations at the center left. It's happening all over. From the movie Deja Vu, circa 2006, a Mother Ship slants from upper center to upper left at the top right. A very definite Negative Pole Anchor Ship Radionic field sits front and center behind the ferry at the center left. A Mother Ship pod similar to Figure 32 in Starrgram 7 and also Figures 8 and 27 in Starrgram 2, sits above the Hotel at the right. Figure 20 - You've heard of the airy fairy, how about the airy ferry. The next Figure off the Internet is a stellar picture of a fully fledged Mother Ship field, Figure 24 in Starrgram 5, mixing it up with a fully fledged in a fully fledged Negative pole Radionic Anchor Scout Ship field. Some days you get all the luck. Figure 21 - Little House on the Prairie, no kidding. Then in a big switcheroo, the following Figure off the Internet shows a very bold Father Ship with an even bolder looking Mother Ship on top in the center, both within a not so bold Negative Polarity Scout Ship field at the bottom left barely showing in the covering clouds. Nonetheless, you can't deny it is what it is. Figure 22 - If it wasn't for our Radionic fields, I don't know what we'd do with ourselves. The following unusual photograph also from the Internet, is like looking at the right end of Figure 6 in Starrgram 4 only switched from right side to left. It is an interesting look at a Negative pole Radionic field seen at a distance straight across at an outer end of the field instead of from the usual viewpoint somewhere underneath in the middle. Judging by the size of the cumulus clouds in a line across the middle, it is a fair distance off. A fairly large Father Ship field is sitting square across the end of the Field in the center of the picture. Figure 23 - Well we've got to settle in somewhere don't I. No doubt by now you have been asking what would happen if a Mother Ship plunked right down tight under the influence of a Negative pole Anchor field apex. The following photograph taken in Huntsville, Ontario on August 16, 2016, and previously seen as Figure 7a in Starrgram 7 shows an answer. The Fields interact and become very ersatzsic. The Mother Ship field is sitting right over the Anchor Ship apex, looking at it perfectly centered from inside the Field to the apex. The squiggly Mother Ship Radials exactly cover the apex like it was rigged. And look how close in it is. This is almost hand shake close. Figure 24 - Here we are, not too far, if you look carefully you'll find out what we are. 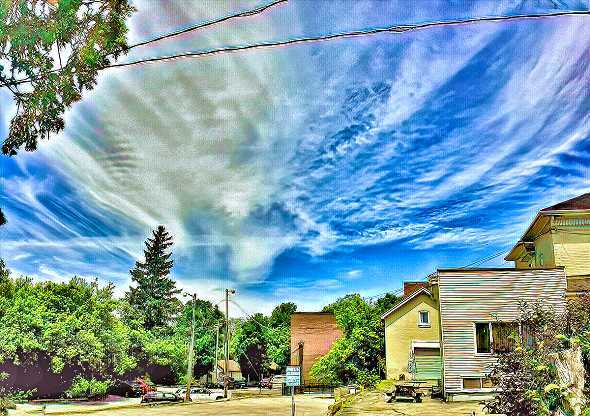 Figure 43 from Starrgram 6 is somewhat similar, this time featuring a pending Saucer Shaped Father Ship Cloud sitting right in front of a Positive Polarity Radionic Field. As can be seen below, it's close enough that the magnetic Fields are interacting in a very interesting way. The combination of the two magnetics is even causing the cumulus clouds hanging around in front to diverge from their normal fluffy cotton batteny selfs. The Figure below is another frazzled looking Mother Ship field under the influence of a Radionic Field whose Radials have been completely incorporated in. This is a relatively wide Mother Ship unlike the one above which is quite small. Figure 26 - Jurassic Park was never this erastzic. 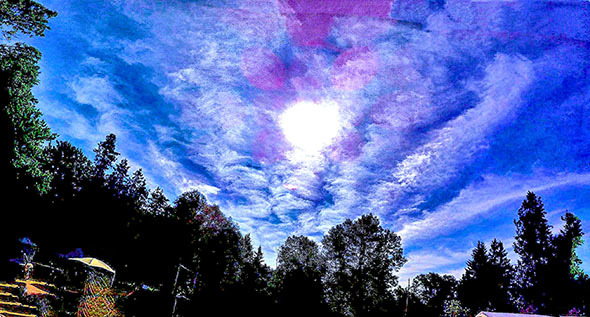 The following Figure below taken at the train station in Brantford on the 11th of May 2016, is fish tail Mother Ship equivalent of the Figure above. Similar to the Figure above the Mother Ship field is sitting over the end of the Negative pole field which is coming in from the right. The Mother Ship guppy tail is also throwing off to the right. As you can see there is now a really blended combination of really J-ersazic Park like Radials and tendrils. The originating Mother Ship field sits calm cool and collected along the bottom. Figure 27 - Nothing to worry about, just a bit more electricity in the air today. On the other hand, in the Figure below a much longer Mother Ship much farther away sits lengthwise across the Negative Pole Anchor Ship field in the middle, showing the same kind of frazzeled Radial/tendril combinations as above. Nothing like having it all, great house, great view, great Radionics. The Morse Code extending down from the Mobile Ship gumball just left of center is dealt with in Volume II. There's no doubt about it, it helps to have a lot of money. Figure 28 - I know how to save money, I just like to spend it. A very similar view from off the Internet is a short Father Ship version of the above, showing a really electrified looking combination of Radials and frillies. Look sharp, you just might happen to see a silver Mother Ship hanging tight just to the left of the sand dune. Figure 29 - Talk about a bad hair day. It can get even wilder. The Internet photo below of a Mother Ship sitting in a Negative Pole Anchor Ship Field looking across English Bay in Vancouver, British Columbia, says it all. An absolute plethora of Mobile Ship Condensates all over the place, plus a cigar Shaped Father ship sitting right in the middle doesn't hurt either. The Father Ship shape may be illusion. A pill Shaped Saucer Ship seen on edge at a distance would look exactly the same. Here's the Uncertainty Principle all over again. Is it an M&M or a weenie. The following picture off the Internet tells about fifty stories. You know by the previous examples what happens when a Mother Ship Field or Father Ship Field gets together with an Anchor Ship Field. But what would happen if a Pyramid got into the picture. Everyone knows that Pyramids are supposed to give off stuff out the top. Why the heck else would you buy one for your coffee table. The image below shows 'what' pretty good. Namely, the Mother Ship Field gets boiled in oil. Any one who thinks that pyramids are just chunks of rock need to look again. Even the Father Ship Field coming in from the left is taking a hit. The original pyramids were introduced fourteen thousands years ago as Energy frequency transformers. Earth had just entered the Virgo Dispensation, which is Earth Energies related. The Pyramids were set to help in the induction and distribution of the incoming Virgo Astrophysical radiations which were pretty powerful at the time. The incoming radiation were received in the Planet's Fifth Dimension. The Pyramids were all located over Planetary vortices, where the Energies would concentrate, rise up through the Pyramids, and be radiated back out to the Fourth and Third Dimensions. Figure 31 - Ahhh, the Cosmic equivalent of a nice Sauna. 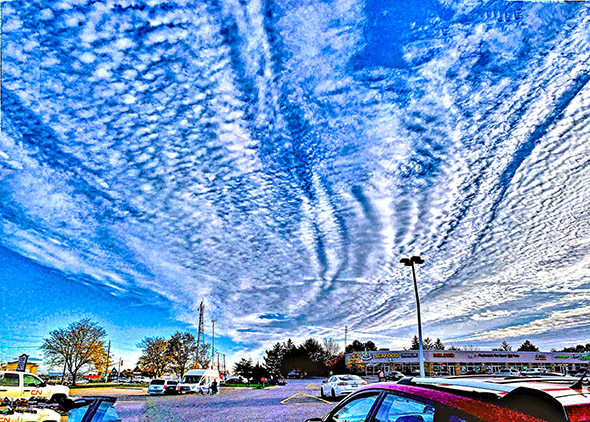 A less busyr version of a Mother Ship Field mixing it up with a Negative pole Radionic field was similarly taken in Brantford on September 24, 2017. This time the view was straight across the page. The Mother Ship guppy tail is to the right The photo had been taken at an optimum moment and both fields are pretty symmetric. The Mobile Scout Ship condensate sitting smack dab in the center of the photograph is relatively large so is hanging in there relatively close. Figure 32 - Somebody said that geniuses tend to talk to themselves. We've been talking to ourselves ever since. A yet again similar photographed in Brantford on the 20th of May, 2017, likewise shows a Negative pole Radionic field and a Father Ship field sitting together across the view instead of down its length like Figure 29 above. This is a particularly interesting interaction. The influence of the Father Ship field has completely converted the Anchor Ship Field Radials into intermittent frazzels on the center and right, plus has cleared out a significant portion in the middle. A similar photograph to the one above found on the Internet, also shows a Mother Ship Field interacting with an Anchor Ship Field. This time it is mixing it up with a Positive Polarity field somewhat similar to Figure 17 above. Also notice the perfect little Mobile Ship Condensate sitting above the tree at the bottom left. Most of you might not have caught it, but the Mother and Father Ship Pair sitting side by side along their length in Figures 6a and 6b in Starrgram 7, were also sitting from one end to the other exactly within a respective Negative pole to Positive pole Radionic Anchor Ship Radionic Field. Figure 6a, as presented again below shows one end of the Mother and Father Ship combination coming straight out of a Positive pole field. And in fact helps to form it. Unfortunately, dry air coming in from the right squelches it from being an otherwise absolutely perfect blue V Radionic Anchor Ship Field as well. Notice how the apartment building almost seems to be the source. Figure 35 -You try, you cry, you ask why then sigh. Incoming dry air in the Figure below, this time from the left side, likewise blew Figure 6b in Starrgram 7 from being likewise an absolutely gangbusters Negative pole Anchor Ship field all the way. Still pretty decent nonetheless. A Herculean effort had been made at the time to photograph the whole Anchor Ship and the Mother and Father Ship combination by successive side by side sets down the length. But the end result was somewhat like a hundred piece jigsaw puzzle with nothing but a blue sky and whit cloud to work with. With lots of time on hand and nothing to do but try and figure out which side by side combinations were which that would work well enough to get a finished PhotoMerged end product sweep by sweep, then a PhotoMerge of all the sweeps together might have done it. But there just isn't time enough left in the Universe to get it done, so it never happened. Figure 36 - All of me why not take all of me, cause tried and couldn't. As often said before, Mother Ships and Father Ships can be very large and very small. The can also be very long and very short. Opposite to the mammoth Mother Ship and Father Ship pair in the Radionic Field above, the following photograph shown as Figure 20a in Starrgram 4 shows a very small Mother Ship just to the left of the center apex. Short is a relative term. It's still pretty big if you were sitting in it, just no where as big as if you were in the one the two Figures above which was miles long. Lenticular Lenses over mountains also like to get into the picture. With Radionic events happening all around the world all the time and lenticular clouds happening frequently in Zephyr breeze type areas, it was inevitable that the twain should meet yet again. And twain they did as the following spectacular moon lit photo from off the Internet aptly shows. This one has a Negative Polarity Anchor Ship Field up the middle and the Radionic Field of a very large Mother Ship coming in from the right. Figure 38 - We don't mind people stealing our thunder as we have no thunder to steal. We are here to work and not for getting noticed. As much as you can see things at night, everyone knows you can see a lot more during the day. Like how about a dramatic lenticular cloud with the left side of a dramatic Mother Ship Field like Figure 31 in Starrgram 5 sticking out from behind it in the Internet Figure below. Plus a Father Ship Field showing coming in at the left. Figure 39 - Who's the Boss. Regular combination Radionic Fields also occur over mountains. Why not, regular single Radionic Fields over mountains and/or sea have shown up on and off since Starrgram 2. The following image off the Internet is a beaut. A Father Ship Cloud fills the left side, a Flying V Positive Pole Anchor Ship Field fills the right. Fish probably fill the lake. The view probably filled the camera. Figure 40 - Nothing fishy about this one, you see what you see. The following Internet image below of the Rampart Mountains in Jasper, Alberta is additionally interesting for showing a very distinct Father Ship Field on the Left, plus a distinct Anchor Ship pair arch in the middle even though the left side Anchor Ship Field isn't visible. The fricassee fried look of the tops of the cumulus clouds at the center and right are because they're loaded with Mobile Scout Ships a' la Volume II. Figure 41 - Jasper National Park, make it's in our to-do list. As much as there is confusion between the tin pot UFOs of the Alien contamination and the Radionnic Ship of the Heavenly Host, an even greater confusion exists between the personages of 'Lucifer', 'Satin', and 'The Devil' among the world's religions. Lucifer was the Male side of the First Level Lanonandek Son/Daughter administrator of this whole Local Solar Sector of Orion who concocted the whole Rebellion thing five billion years ago. Satin was the Female side of a Third Level Lanonandek Son/Daughter in training, who took Lucifer's Manifesto to the planets as Ambassador under the misconception that it was for their greater good. Satin has recently returned to the feet of Christ as a Prodigal Daughter and has received complete absolution. Lucifer, who has been in solitary confinement for the last three million years on Zaab, has finally started coming out his ages long stupor and has a very long way to go. Starrgrams 15, 16, and 17 of 'The Revelatorium of Alpha and Omega' deal specifically with this topic. There is no personage called 'The Devil'. The sic, 'Devil' is Mankind's conglomerate lesser condition looking for an excuse. Religions have latched onto the notion as the hook for reeling believers into the flock. As in sic, 'The Devil's gonna get you, join with us and we'll make sure he don't'. There are other Figures in the Starrgrams with Anchor Ship fields holding the partial presences of a Mother Ship or Father Ship or both. You are welcome to challenge yourself and look.